Keeping in mind the perpetually increasing pollution level, Air Purifiers are a must buy, be it home or office. KENT Aura HEPA Air Purifier has been designed with advanced and most innovative features that help in complete purification of the air around you. It eliminates the different micro-organisms present in the air and keeps you and your family in good health.The new Aura HEPA air purifier by KENT consumes only 45 Watts of power and it comes with a highly efficient purification capacity. With the Effective Room Area up to 270 sf. Ft. it offers optimum result and eliminates the harmful bacteria and other pollutant present in your room. Its pedestal mounting helps in convenient usage of this appliance. Weighing only 5 kgs, the Aura KENT air purifier consists of a one-touch child lock feature. This product by KENT comes along with 1 year KENT India warranty. KENT Aura HEPA Air Purifier uses the most innovative HEPA Filter that is known to completely eliminate the micro-organisms present in the air. The HEPA Filter in Aura KENT air purifier wears a special coating that eliminates the bacteria present in the air. Other than this, the HEPA Filter also results in complete elimination of the PM 2.5 and SPM (Suspended Particulate Matter) that is found in the air inside your home or at office. The best part of the new KENT AURA is that it consists of a Filter Change Indicator, which alarms you when there’s a need to replace the filter. The new KENT Aura HEPA Air Purifier also consists of a Carbon Filter that ensures the flow of completely purified air inside your room. The Carbon Filter uses the especially treated activated carbon that not only eliminate odour and foul smell from the air but it also successfully eliminates the Volatile Organic Compounds, Hydro Carbons, Oxides of Sulphide and Nitrogen, pet odour, dust and most importantly the cigarette smoke. KENT Aura HEPA Air Purifier consists of a built-in ionizer that perpetually ionizes the air inside your room. The built-in ionizer not only keeps the air fresh but it also sets your mood. Other than this, the new Aura KENT air purifier also consists of in-built intelligent light sensors that indicates the quality of air using a glowing LED. The light sensors continuously monitor the quality of air present inside your room and ensure the clean air flow round the clock. KENT Aura HEPA Air Purifier comes with <=60 dB of the noise level. It means that when compared to the old models of Air Purifiers, the new Aura HEPA Air Purifier performs very silently, without causing any sort of disturbance while you are asleep. 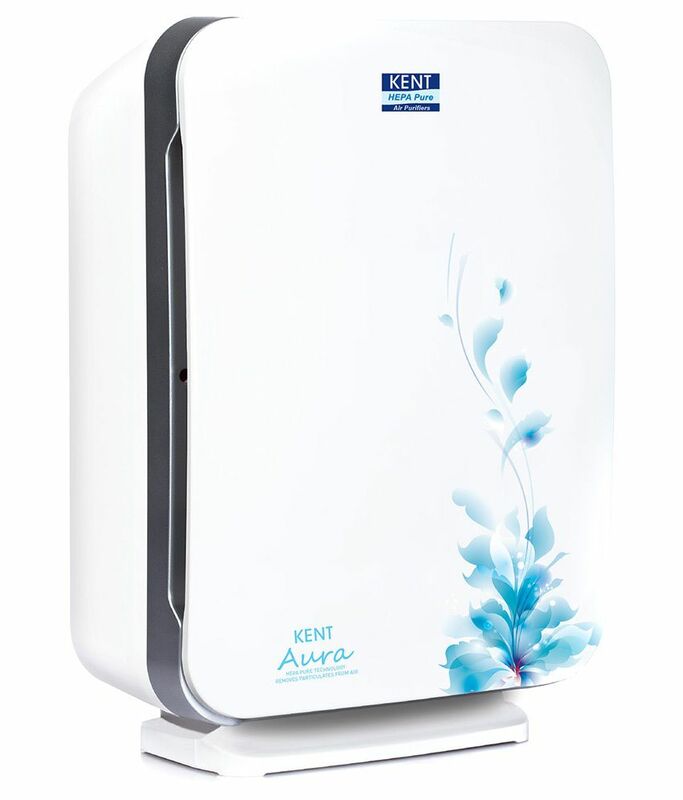 KENT Aura HEPA Air Purifier has been ergonomically designed. It offers pedestal mounting and therefore, it is ideal to be used not only at homes but even in your office. With its 3 different speed setting options, you can easily customise the speed of this Aura Air Purifier by KENT. It also consists of an 8-hour Timer Function. KENT Aura HEPA Air Purifier offers 180 m³/hour CADR (Clean Air Delivery Rate) that means complete and quick purification of air. With such a high capacity, the new KENT Aura Air Purifier is ideal to be placed in your dining room or your bedroom. It cleans and purifies the air instantly and thus ensures complete protection against the severe air-borne diseases.